There are many new TOP level domain names being released to the public every month. I have compiled a spreadsheet of TLD prices on google docs. Why should you care about the new TLDs? For example, let’s say you have a new business idea and you want to buy the domain name for your company. Instead of using reallyverboseandlongname.com you might use a clearer, and shorter shorter.website or shorter.club among hundreds of generic top level domains. How do you pick the Best TLD for you? Conveniently, enom.com has categorized the new names based on your company’s industry. Imagine you’re a limousine company, among thousands in a given city. What domain name would you choose for you website? Many limo companies use something like CITY_NAME + “towncarservice.com” because when they registered their website in the mid 2000s that’s all that was left of the most obvious dot com names. In 2015, you might still find the lucky CITY_NAME.limo or AIRPORT_NAME.limo as available options on namecheap.com or various other registrars. Compared to 2005, you have many more options in 2015. ICAAN is the organization responsible for permitting new .names — technically known as generic top level domains. In the past few years they have released an increasing number of new names like .limo, .club, and .website among others. There are so many new names, that if you try and search for a new TLD domain name on namecheap.com your browser window will slow down after loading all of them. If you just want a cheap tld, then sorting through the list is even harder. How do you sort through it all? Beyond topic or category, price is also very important when you chose a new domain. Some top level domains like .luxury cost around $500 per year from most registrars ($488.88/yr on namecheap when I checked). Others like .best might cost $90 per year — quite far from the cheaper tlds. 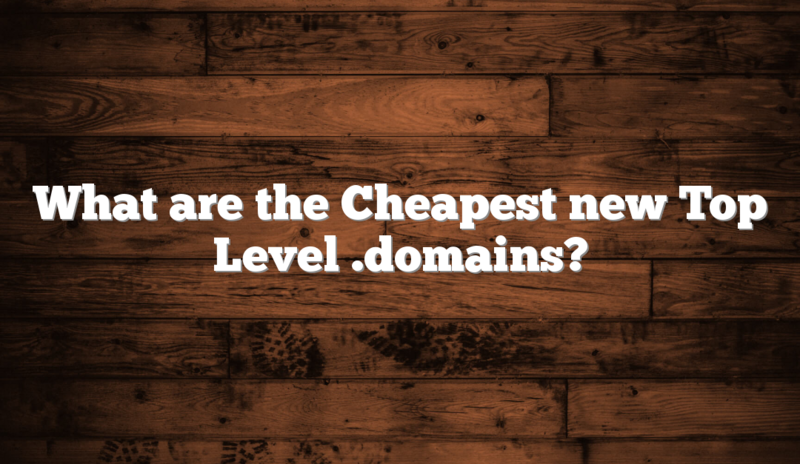 Here are a few more expensive TLDs, with some of the highest prices I’ve seen for non-premium domains. For reference, the average .com name is 10 dollars per year from most domain name registrars — and that’s before using any coupon codes. If you want to see the full list of the best deals, I made a list of cheapest TLDs along with their prices on google docs. Now that you’re informed, I wish you good luck with your next domain purchase. Finally, Let me leave you with a parting question: have you recently bought a domain name with one of these new gTLDs? If you have, you can share the domain in the comments. If you haven’t, then I’d like to know why not. If you found a sale that’s even cheaper than my cheapest TLDs list then please share it below so that I could improve my list. The business model of most of these names is to get you in for the first year cheaply, and then screw you on the second year with a major renewal price. They know you’ll pay it because you’ve already built your site.